Henry Kneebone followed a socialist-Christian tradition reminiscent of British social reformers like Robert Owen and William Morris. His daughter wrote that ‘he was a Socialist in the sense that he considered Jesus Christ was a Socialist’. Described as ‘burly in figure, genial and generous in spirit’, and a man of ‘distinguished appearance and upright bearing’, Henry (Harry) Kneebone was born at Wallaroo Mines, South Australia, on 17 March 1876, to Henry Kneebone, a miner of Cornish extraction, and Elizabeth Ann, née Tonkin. Harry’s love of reading was strengthened by twelve months of enforced rest as a child after breaking his leg twice. In his Senate speeches Kneebone was to draw upon the works of Cobbett, Carlyle and Ruskin. Educated at Kadina Public School, Kneebone left school at the age of twelve. He began work as a ‘printer’s devil’, becoming an apprentice compositor with the Kadina and Wallaroo Times. Brought up in the Bible Christian Church, he became organist at the Kadina Methodist Church. In 1894 he tried his luck as a gold prospector in Western Australia and when this failed worked on the newly established Coolgardie Miner, rising to become its managing editor in 1906. In 1900 he travelled to England and Europe with his father, visiting the Paris Exhibition and relatives in Cornwall. Keenly interested in Pitman’s shorthand, while overseas he learned shorthand and typing. At some time he taught shorthand at the Coolgardie Technical School. On 4 November 1903, he married Henrietta Whitta at the Methodist Church, Coolgardie. There would be six children of the marriage. (His three daughters attended Methodist Ladies College in Adelaide.) It was during his time in Western Australia that Kneebone first became active in public life. He was a foundation member, and later secretary, of the Coolgardie Typographical Society, secretary of the local branch of the Labor Party, and a member of the Western Australian Workers’ Association. He was five times president of the local Australian Natives’ Association. He was elected to Coolgardie Town Council in November 1908, being defeated for mayor in 1909. In 1910 Kneebone took up a position with the Adelaide-based Labor paper, the Daily Herald, becoming its editor the following year. In 1912 the federal Labor Government appointed him press officer at the Australian High Commission in London, where he helped publicise Australia through lectures and articles, and a series of pamphlets translated into French, German and Italian. He also helped found the London branch of the Australian Natives’ Association. After the outbreak of war, he represented Australia at the British War Press Bureau (1914-15), and founded the Anzac Buffet, which provided Australian soldiers in Britain with free meals and entertainment. Kneebone returned to Adelaide in 1916 to become managing editor of the Daily Herald, and took a leading part in the campaign against conscription. A prominent trade unionist and active member of the Labor Party, he became a regular contributor to the Labor Ring at the Botanic Park. He represented the Printing Industries Employees’ Union on the United Trades and Labor Council (where he was president for a term); served on the ALP’s state executive from about 1920; was party president (1922-23 and 1930-31); and was a member of the Federal Executive in 1924 and between 1928 and 1932. He also attended the All-Australian Trades Union congresses in 1921 and 1922, and Labor’s federal conference in 1921, at which the burning issues of the socialist objective and the One Big Union were debated. He was one of two vice-presidents elected at the inaugural conference of the Australian Council of Trade Unions in 1927. Kneebone first stood for Parliament in the state seat of Sturt in 1921, and contested the federal seat of Boothby in 1922; he was defeated on the latter occasion by J. G. Duncan-Hughes. In 1924 he was elected to the South Australian House of Assembly for East Torrens, where he advocated nationalisation of banking and insurance, state ownership of utilities, the socialisation of industry, protection, universal education (he objected to children being directed at a young age into vocational training) and the abolition of corporal and capital punishment. He resigned from the House of Assembly in 1925 to re-contest Boothby, but was again unsuccessful. He then worked for a number of years on the staff of the Adelaide Advertiser. On 1 April 1931, at a joint sitting of both houses of the South Australian Parliament, Kneebone was elected, under section 15 of the Constitution, to the casual vacancy caused by the death of Country Party Senator J. H. Chapman, commencing his Senate term from that date. Under existing electoral law he served until the next election. Despite spending less than a year in the Senate, Kneebone was to display considerable oratorical and polemical skill. One of his daughters, Joan, later recalled an incident that indicates how much effort he put into his speeches. It seems that not long after his appointment to the casual vacancy the family awoke one night to hear their father expounding his ‘Maiden Speech’, only to discover that he was fast asleep. Two themes underpinned many of his speeches—support for centralisation of power at the federal level and the importance of a tariff-protected secondary industry to solve Australia’s economic ills. In line with party policy, he supported the fiscal expansion provided for under the Fiduciary Notes Bill and the centralised control of national finance under the Central Reserve Bank Bill. Australia, he said, was suffering from ‘pure capitalism’. His socialist ideology was close to the surface when he stated: ‘Among the principal causes of our present troubles are unregulated production, uneconomic distribution, and uncontrolled exchange’. His support for secondary industry derived from his belief that it provided the greatest medium for the production of real wealth in Australia. The nation, he argued, would never develop if it confined itself to primary production. 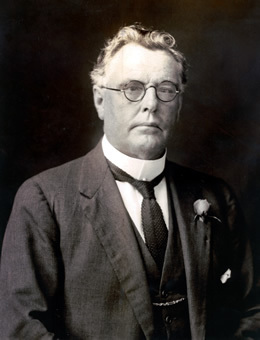 Although he regarded neither protection nor free trade ‘as the beginning and end of a nation’s policy’, he maintained that anti-protectionism was un-Australian. He believed that ‘if we are to maintain our ideal of a White Australia, and to refuse to accept the goods produced by cheap and coloured labour in other countries, we must have some tariff barrier’. Kneebone was ‘an uncompromising opponent of the Premiers’ Plan’. As president of the South Australian Labor Party he was in the chair at stormy meetings in July and August 1931 that supported the expulsion of state and federal parliamentarians who had erred by supporting the plan; these included his colleagues, Senators Daly and O’Halloran. As a member also of the Federal Executive, Kneebone tried in vain to run the meetings in accordance with the rules of both organisations, no easy task in those troubled years. In the Senate, Kneebone joined the Langites Dunn and Rae and Labor colleague Senator Hoare in voting against the Scullin Government’s Commonwealth Debt Conversion and Financial Emergency bills, regarding both as a form of repudiation akin to default. He suggested that if the Government wished to save money it could look no further than the abolition of state parliaments. His views on the Senate were revealed when he pleaded the case of the waterside workers of Port Adelaide during the protracted controversy over the Opposition’s refusal to allow regulations restoring preference to waterfront unionists. He acknowledged ‘that the Senate, as perhaps the highest authority in the Commonwealth, must protect its rights’, but submitted that in ‘a tussle between the two chambers the popular House should be supreme’. When questioned whether he would repudiate the Constitution, Kneebone responded in frustration: ‘I want to amend it. If the people were consulted they would favour the abolition of not only the State Parliaments, but also the Senate’. At the general election in December 1931 Kneebone was defeated, his place taken by his old nemesis, Duncan-Hughes. He returned to his work in Adelaide, though his daughter relates that Kneebone’s criticism of media monopoly in the Senate led newspaper editors to turn their back on him. Nothing daunted, he set up his own paper, the Labor Advocate. He was also vice-president of the ACTU. In 1933 he unsuccessfully contested the two‑member state seat of West Torrens (a three‑cornered contest between the ALP, Lang Labor and the Premiers’ Plan Labor Party, won by the latter). His unremitting work for the Labor cause ended shortly thereafter, for he died unexpectedly on 22 December 1933, aged fifty-seven, and was buried in Mitcham General Cemetery, survived by his wife, two sons, Harry and Frank, and three daughters, Elizabeth (Thelma), Ethelwyn (Wyn) and Joan. It was said of him by Senator Hoare that he was an ‘ideal Labor man’, one of ‘untiring effort and outstanding ability’ whose ‘actions bore the hallmarks of sincerity and honesty of purpose’. It seemed a fair tribute. In 1961 Kneebone’s son, Frank, became a member of the Legislative Council and from 1965 to 1975 served in the Walsh and Dunstan ministries. His other son, Harry, became sporting editor of the Advertiser. Joan Tiver, Harry Kneebone: A Son of ‘Little Cornwall’ 1876-1933, Urrbrae, SA, ; Neal Blewett, ‘Kneebone, Henry’, ADB, vol. 9; Advertiser (Adel. ), 23 Dec. 1933, p. 15; Letter, Kneebone to Josiah Thomas, 4 Mar. 1912, A1, 1915/8710, NAA; Coolgardie Miner, 26 Nov. 1908, 25 Nov. 1909, 24 Dec. 1909; Letter, Kneebone to C. E. W. Bean, 25 Sept. 1933, AWM43, A459, NAA; J. E. Menadue, A Centenary History of the Australian Natives’ Association 1871-1971, Horticultural Press, Melbourne, , p. 167. Printing Trades Journal (Syd. ), 13 Feb. 1934, p. 21; Jim Moss, Sound of Trumpets: History of the Labour Movement in South Australia, Wakefield Press, Netley, SA, 1985, pp. 250-1, 262; Advertiser (Adel. ), 26 Dec. 1933, p. 12; Patrick Weller and Beverley Lloyd (eds), Federal Executive Minutes 1915–1955, MUP, Carlton, Vic., 1978, pp. 85, 125, 172–3; Labor Advocate (Adel. ), 5 Jan. 1934; Jim Hagan, The History of the A.C.T.U., Longman Cheshire, Melbourne, 1981, p. 83. SAPD, 6 Aug. 1924, p. 143, 3 Sept. 1924, pp. 502-4, 2 Oct. 1924, pp. 907–9, 28 Aug. 1924, p. 435, 4 Dec. 1924, p. 2147, 29 July 1925, p. 181, 25 Nov. 1924, pp. 1852-5, 24 Sept. 1925, p. 915. SAPP, Joint Sitting of the Houses of Parliament, 1 Apr. 1931; Advertiser and Register (Adel. ), 1 Apr. 1931, p. 9, 2 Apr. 1931, p. 19, 17 Apr. 1931, p. 19; Tiver, Harry Kneebone, p. 45; CPD, 16 Apr. 1931, pp. 888-97, 22 Apr. 1931, pp. 1103-14, 5 Aug. 1931, p. 4956, 9 July 1931, p. 3595. CPD, 9 July 1931, pp. 3592-3, 4 Nov. 1931, pp. 1428-38, 5 Aug. 1931, p. 4961. Sun News-Pictorial (Melb. ), 3 July 1931, p. 2; Advertiser and Register (Adel. ), 14 Aug. 1931, p. 21, 21 Aug. 1931, p. 19; CPD, 9 July 1931, pp. 3587-96, 10 July 1931, p. 3765, 15 July 1931, pp. 3857-8, 3889, 2 July 1931, pp. 3273-86, 20 May 1931, pp. 2085-7, 21 May 1931, pp. 2166-9, 28 May 1931, pp. 2338-43. Tiver, Harry Kneebone, pp. 45, 52, 65, 134; Herald (Melb. ), 2 Apr. 1931, p. 8; Sun News-Pictorial (Melb. ), 26 Feb. 1930, p. 7; Advertiser (Adel. ), 23 Dec. 1933, pp. 6, 15, 26 Dec. 1933, p. 12; CPD, 28 June 1934, pp. 5–6; Australian Historic Records Register, 1989, NLA. This biography was first published in The Biographical Dictionary of the Australian Senate, vol. 2, 1929-1962, Melbourne University Press, Carlton, Vic., 2004, pp. 264-267.